We will consider three of the most famous artifacts from the "Royal Tombs of Ur". 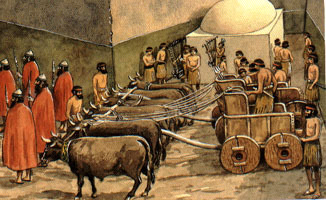 They were uncovered in the late 1920s by C. Leonard Wooley in conjunction with the University of Pennsylvanina at that part of Ancient Mesopotamia which is now modern day Iraq and were part of the Sumerian culture at its zenith (circa 2600-2500 B.C.). At the time of its discovery it competed for public attention only with the uncovering of the intact tomb of King Tutankhamun of Egypt. The bodies of six guards and 68 court ladies were found in the grave at Ur called the Great Death Pit. Wooley thought that they were the servants of kings and queens who had been chosen to accompany them to the after life. They walked down into the grave in a great funeral procession. Then they drank a poisoned drink and fell asleep never to wake again. The fitst artifact we will consider is a bull's head which was part of the frontal frame work of a large lyre. 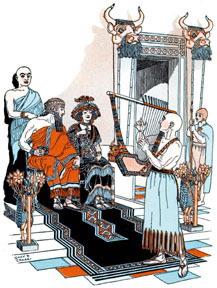 The image shown below is a section of the "Standard of Ur" (probably a musical sounding box) which depicted various scenes of life in the ancient kingdom. Here you can clearly see a musician playing a lyre whose frame is decorated with a bull's head. Below is the original gold and lapis lazuli bull's head with an inlaid plaque beneath it depicting mythical animals drinking and performing; beneath it is an enlargement of the plaque; and beneath this is a reconstruction of this more than 4500 year old musical instrument. If you would like to listen to some hypothetical ancient harp music as composed by researchers for this harp, click below. 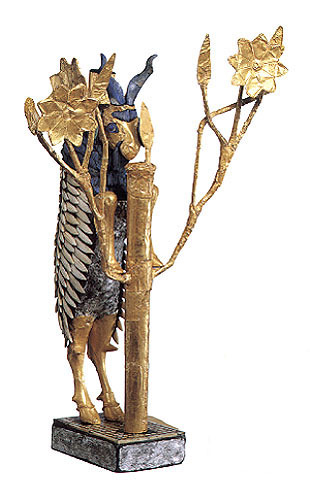 The following artifact recovered from the Tombs is one of the several statuettes which have been whimsicsally referred to by Wooley as a "ram caught in a thicket". This is because Ur is supposed to be the birth place of Abraham who sacrificed such a ram in lieu of his son, Isaac. However, archaeologists believe that it is really a goat standing on its hind legs eating the leaves of a tree. 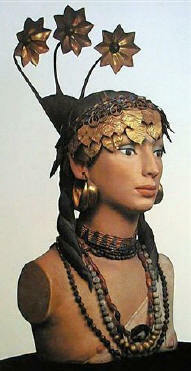 The statuette is composed of gold, silver, lapis lazuli, copper, shell, red limestone and bitumen. Notice the shape of the "flowers" or "rosettes" and that they each have eight points. Entwined in the branches of a flowering tree, two goats appear to be nibbling on its leaves. This decorative plaque which was carved from shell and highlighted with bitumen was also excavated from the Royal Tombs. Notice the stylized rosette between the two goats which is similar to those on the tree of the "ram caught in a thicket". The next artifact is Queen Puabi's headdress (diadem) composed of gold, lapis lazuli and carnelian. It, along with several other pieces of jewelry, were also excavated from the Royal Tombs. Notice the "flowers" or "rosettes" on top of the headdress and how they are similar to those on the ram's thicket and how they each have eight points. Throughout Mesopotamian history, kings are associated with sacred trees. Below is an impression from a marble cylinder seal from fourth-millenium B.C. Uruk in southern Mesopotamia, showing a ruler feeding two sheep from a sacred tree. This seal, if dated correctly, is several hundred years earlier than the artifacts from the Royal Tombs of Ur. Notice the striking similarity of the "flowers" or "rosettes from this tree to those shown above, both as to their shape and how they each have eight points. This must have been an idealized standard for certain sacred trees in ancient Mesopotamia. Trees were a common fertility symbol throughout the ancient Near East. The nourishment provided by trees may have suggested a fertility goddess's life-giving force. The symbol of the rosette was used in ancient Mesopotamia for protection and good luck. Apparently the use of rosettes was not limited to sacred trees. Below is an image of a gold cup and next to it is the image of a rosette engraved on the bottom of the cup. This cup is also from the Royal Tombs. The table below presents a comparison of the three rosettes taken from the Ram Statuette, Queen Puabi's diadem, and the Uruk seal impression. The three images below were part of the jewelry of Queen Puabi recoved from the Royal Tombs. The first two are decorated "Spanish" combs while the third is a rosette pin. All of the "flowers" or "rosettes" appear to be similar. Things really haven't changed much in the 4500 years since the ram statuette was fashioned in ancient Ur as can be seen from this 1999 photograph of African gerenuk on their hind legs eating the leaves of an acacia tree. The British Museum has an excellent web site on the Royal Tombs of Ur which you can access by clicking Royal Tombs of Ur below. To learn more about sacred trees in ancient Mesopotamia, click on the articles below. 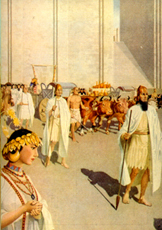 The images shown herein are from "Royal Tombs of Ur"@University of Pennsylvania Museum of Archaeology.com; Archaeology Odyssey (November/December1999);Biblical Archaeology Review (September/October l998); and Mesopotamia, Julian Reade.